Sunday is “big breakfast” day here. Usually some bacon, hash browns and something else like eggs or pancakes or the like. Last Sunday Hubby was working so it was just me and the girls. I tried making something different. For my effort Austin gave me a big hug and kiss, told me I was the best mom mom and made the best breakfast ever. Her words, including the mom mom part,this is what she has been calling me lately. What did we have? 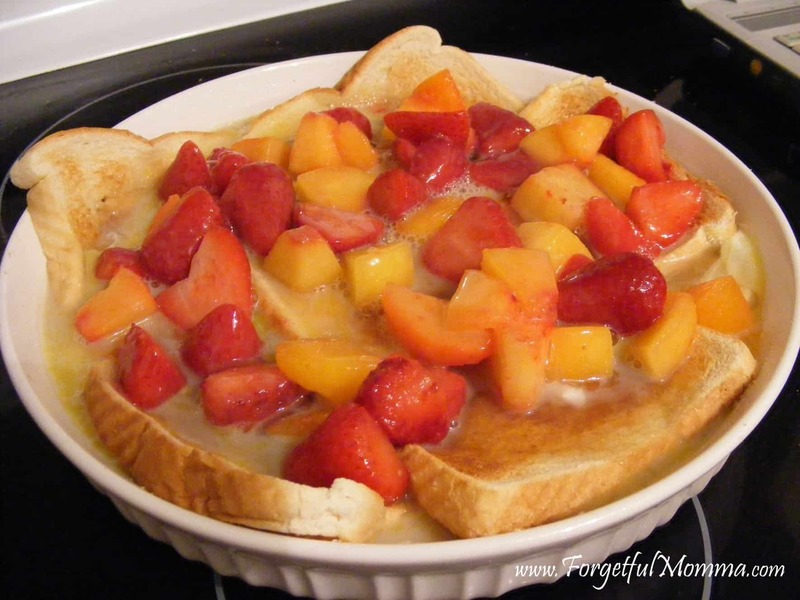 French toast cooked in the oven, easy-peasy. Lay your toast in the bottom of a greased baking pan, I used an 8″ I think it is. I over lapped them so the egg/milk goodness didn’t stick to the bottom of the pan. I squished the toast down too. I cut up some fruit into bite sized pieces, laid it over the toast. Mix together the egg, milk, and syrup, you can add some nutmeg or cinnamon if that is how you prefer your french toast. 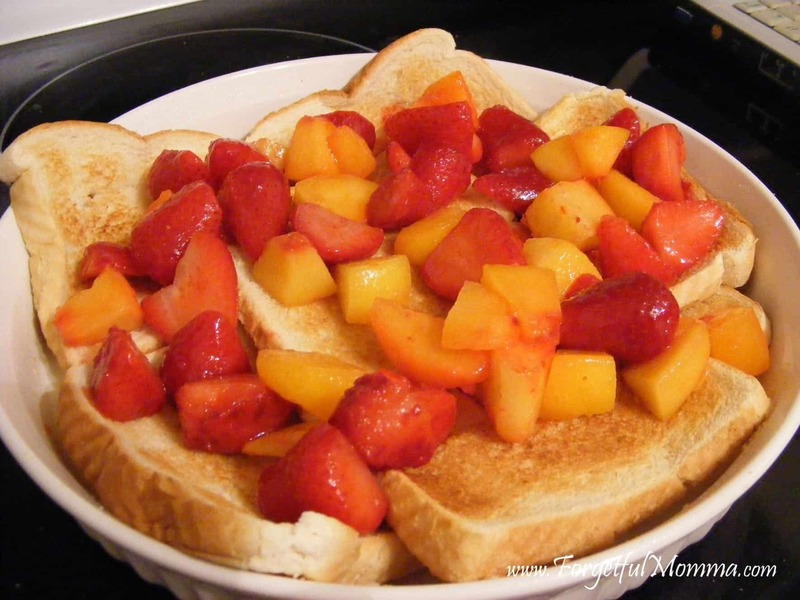 Pour over your toast and fruit. Bake in a preheated oven at 350 for 45-50 minutes, or until golden brown and all liquid has been absorbed. The kids loved it. Being that there was only the three of us, there was leftovers. It was even better reheated. I reheated my piece in the oven, but did the girls in the microwave, they ate it even faster reheated as well. Definitely a success. 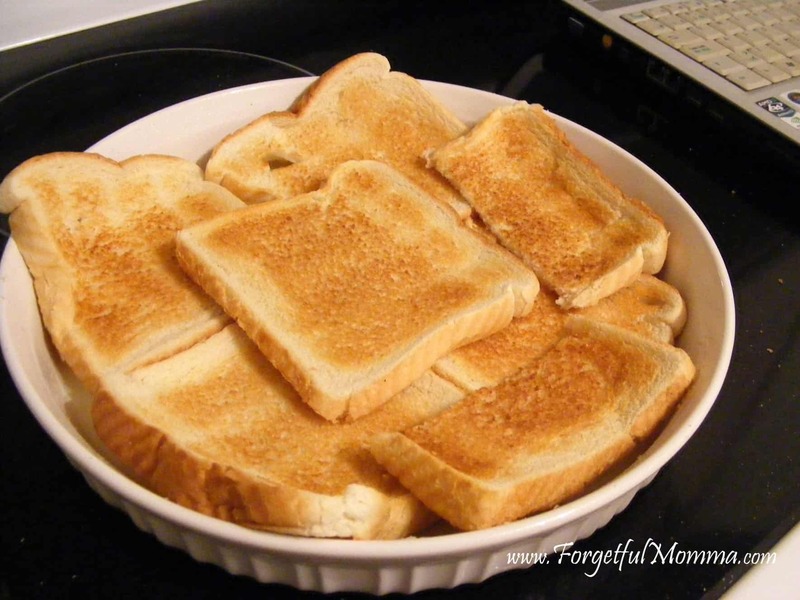 Lay your toast in the bottom of a greased baking pan, I used an 8″. Over lap them so the egg/milk goodness didn’t stick to the bottom of the pan. Squish the toast down too. Cut up some fruit into bite sized pieces, laid it over the toast. 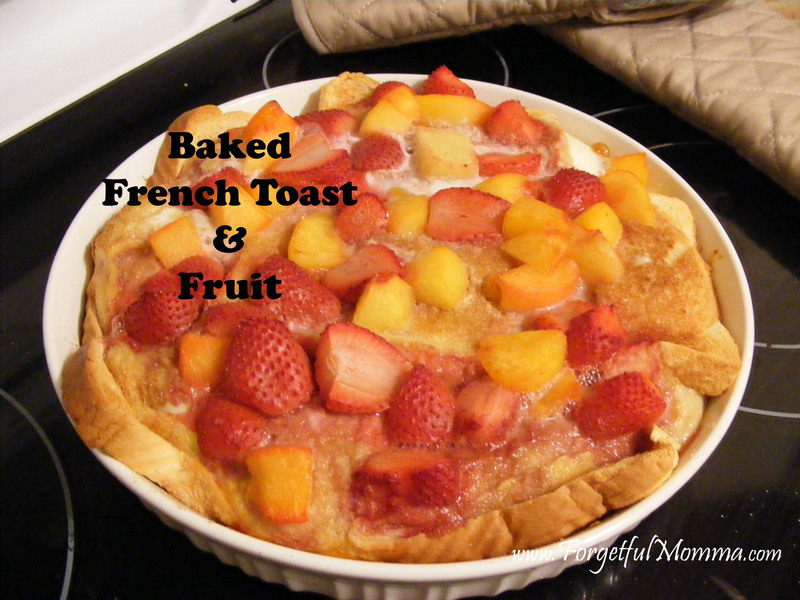 Do you have a favorite breakfast food? Or do you skip it? Previous Post: « Follow Me Wednesday Blog Hop! This looks wonderful. I have to try it. We NEVER skip breakfast. I think I would faint if I didn’t eat breakfast lol. But it is usually the same simple breakfast (which I love and crave BTW) of Weetbix, yoghurt and a few cups of tea. Might have to make an exception one morning and give this a whirl. Thanks so much for sharing with us at Melting Moments. Yum!! What a great idea. Makes much more sense than individual slices! Wow that’s different. I bet it taste great.